Smart Policies for Harnessing AI | The Forum Network, hosted by the OECD: Shape ideas. Shape policy. Shape the Future. The global reach of AI requires a global approach. The OECD is engaged in a wide-ranging discussion on AI with its member countries and beyond, representatives of business, the technical community, labour and civil society and other international organisations. A key outcome of these discussions is the creation of an OECD expert group on artificial intelligence. Few technologies evoke responses as strong as artificial intelligence. Many people instinctively fear machines taking their jobs. Others see changes that help workers expand existing skills and open doors to amazing advances in fields like medicine, education and the environment. AI is likely to have a large impact: it is spreading rapidly and by its nature will affect every sector in the economy as well as society more broadly. Its impact raises big questions for government, business, science and the public as we try to minimise the risks and maximise the opportunities. One of those big questions is the impact of AI on the workplace. 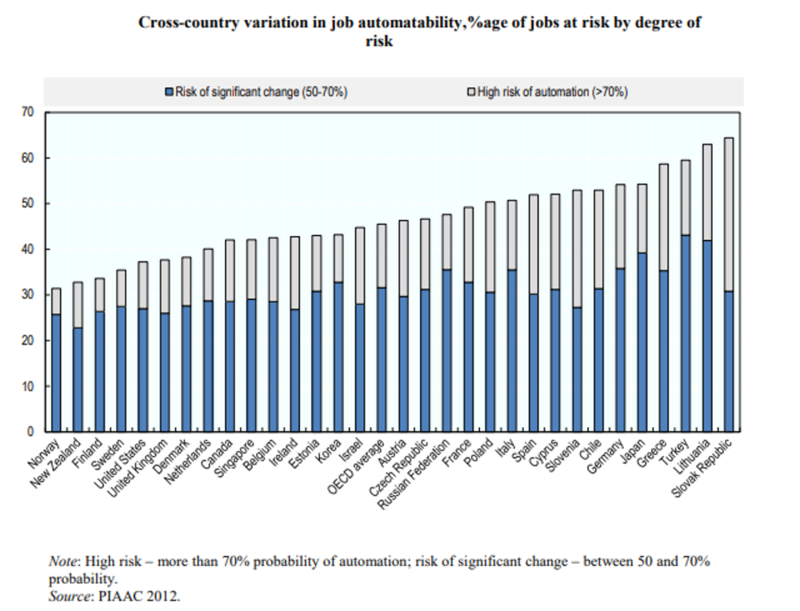 People who are at a high-risk of losing their jobs to automation in the coming years represent are estimated at 14% of the workforce across the OECD countries, with another 32% of the workforce seeing substantial change in how their jobs are carried out. Another question is how AI can improve government services, promote general well-being and narrow the gulf between the world’s haves and the have-nots. Finally, as AI’s ubiquity increases, there is the pressing matter of how to protect privacy and autonomy, and ensure awareness, transparency, safety and accountability. "Finding the answers to those big questions -- and developing and implementing policies and practices -- will determine whether the positive transformations brought about by AI outweigh the dangers." The search for answers is under way. Industry groups, think tanks and policymakers are addressing a wide range of issues. Through the G-7 and G-20, the leading industrial economies are evaluating AI’s impact on productivity and economic growth. The United Nations has recently weighed a potential ban on killer robots and the European Commission will be evaluating principles to guide the future of AI. National governments are also developing AI-related initiatives. For instance, Japan is planning for interconnected AI systems to bridge the physical and digital worlds and drive economic growth. Finland is focused on using AI to build better public services, particularly in healthcare, and Estonia foresees ways in which AI can save costs and improve efficiency. The Organisation for Economic Cooperation and Development is engaged in a wide-ranging discussion on AI with its 36 member countries, representatives of business, the technical community, labour and civil society and other international organisations. The goal is to bring together leaders from across the globe to debate policies and standards that will lead to coherent approaches that enable governments to promote shared prosperity and unlock progress in areas such as work-life balance, health, education and the environment. First, AI policy is an urgent concern because the technology is moving so fast. The rapid pace of development and deployment of AI requires equally rapid development and deployment of good policies. Second, the universal reach of AI and related technologies requires global dialogue and collaboration across borders and among rich and poor countries to avoid a patchwork of country-specific or regional approaches. 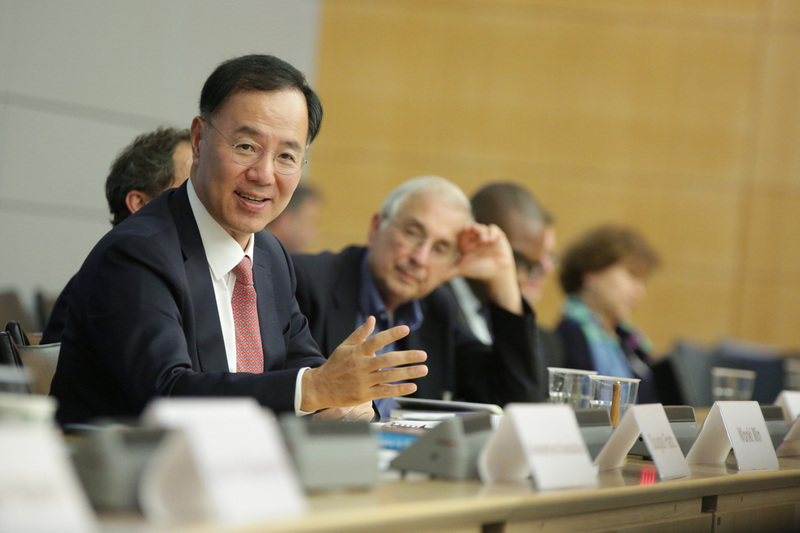 The OECD discussions are occurring at the working level among national delegations, as part of the “Going Digital” project and through conferences and workshops that bring together leaders from the broad community of stakeholders. Last October, the OECD conference “AI: Intelligent Machines, Smart Policies” drew 50 speakers and 300 technologists, senior policy makers and representatives of civil society, labour and business. The two-day discussion focused on the requirements for a coordinated policy response to the transformations being driven by AI systems. Among the consensus points that emerged were a sense of urgency on the part of governments, a need for new policies to adapt AI to the workplace, a recognition that threats to individual privacy and democratic principles must be addressed, and a call for fairness and accountability. In the months since the conference, the discussion has continued through workshops, meetings of the OECD Committee on Digital Economy Policy and engagement with governments, industry, labour and technical and policy experts. A key outcome of the ongoing discussions is the work to develop OECD guidelines to help member countries balance innovation with regulations. The scope will encompass government actions, interactions with the public and norms for business, particularly AI developers. The overall goal is to produce guidelines that reflect the core values of the OECD – democracy, prosperity and inclusivity – and foster universal standards. In the best tradition of the OECD, the guidelines will help governments create national strategies to ensure that AI technologies benefit and empower as many people as possible. Like AI itself, the guidelines will help governments answer pressing questions, like how to manage the AI-driven economic transition, how to build public trust and how to use the power of AI to provide better services for citizens. Coordinated by the Science, Technology and Innovation Directorate, the work is expected to result in a draft recommendation for the Council in 2019. At the same time, planning is underway for an OECD Policy Observatory on AI, which would play an exploratory and pathfinding role. It would bring together committees from across the OECD as well as a wide spectrum of external actors. The goal would be to identify promising AI applications, map their potential economic and social impact and analyse their policy implications. The Observatory would be an interactive online platform providing evidence, analysis and policy options to governments, business, labour and the public. AI will require governments to rethink how they deliver services and protect the privacy of their citizens. It will require business and labour to balance automation with worker well-being. And it will test the willingness of leading economies and global technology corporations to share the positive benefits as widely as possible. The answers to those questions – the policies and standards that will shape the ways that AI changes our lives – lie in a robust, inclusive conversation. [i] Note by Turkey: The information in this document with reference to “Cyprus” relates to the southern part of the Island. There is no single authority representing both Turkish and Greek Cypriot people on the Island. Turkey recognises the Turkish Republic of Northern Cyprus (TRNC). Until a lasting and equitable solution is found within the context of the United Nations, Turkey shall preserve its position concerning the “Cyprus issue”. Note by all the European Union Member States of the OECD and the European Union: The Republic of Cyprus is recognised by all members of the United Nations with the exception of Turkey. The information in this document relates to the area under theeffective control of the Government of the Republic of Cyprus. The sample for the Russian Federation does not include the population of the Moscow municipal area. More detailed information can be found in the Technical Report of the Survey of Adult Skills (OECD, 2014). Part II: outline of future AI regulation (http://www.howtoregulate.org/aipart2/). The Regulatory Institute is a not-for-profit organisation that researches and promotes good law-making methodology and regulatory techniques. We serve law-makers seeking to regulate activities in their jurisdiction and citizens who benefit from the public goods and services that are regulated well. Our vision is that law-makers develop regulations using good law-making methodology, such as the Handbook “How to regulate?” (http://www.howtoregulate.org/the-handbook/), and regulatory techniques, so that regulations benefit us all.